Your gums should never bleed. Not when you brush, not when you floss, not when I clean them…not ever! Bleeding gums can be the first sign of gingivitis. Its likely cause is plaque that has hardened up and under the gum flap at the base of your teeth, causing an insufficiency of blood flow. This can lead to sore, swollen, bleeding gums and, eventually, to much worse – including periodontitis, gum surgery, and tooth loss. The good news is that gingivitis is reversible. Firstly, by doing all the things you already know you should do. Daily (proper) brushing and flossing. Regular check-ups and cleaning. Use of a soft, flexible plaque remover when you can’t floss (see Stim-u-dent). And by regular use of the right mouthwash. That’s where we come in. The Natural Dentist Healthy Gums Mouth Rinse kills the germs that form on your teeth to eventually become plaque. In fact, its antimicrobial activity is unsurpassed by even the leading prescription and the leading over-the-counter mouthwashes (see clinicals). 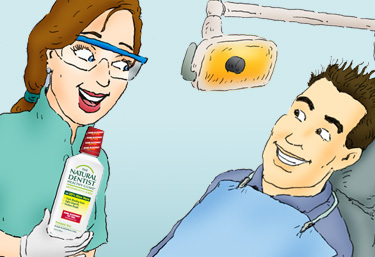 The Natural Dentist Healthy Gums Mouth Rinse is also non-irritating. It contains no harsh chemicals, no alcohol, no artificial flavors or colors. And it contains a therapeutic dosage of aloe vera! An ingredient that has been known and used for thousands of years for its healing and soothing properties. Please read some of the many testimonials we’ve received from people who have been helped by The Natural Dentist Healthy Gums Mouth Rinse. Select a product to read what people are saying. Find locations and special offers near you. Try our no mint mouthwash!